In August, Interior’s Office of Inspector General — which investigates reports of government corruption — opened a preliminary investigation into phone calls Zinke made to Alaskan Republican Sens. Lisa Murkowski and Dan Sullivan, in which he allegedly threatened to block energy projects in their state after Murkowski voted against the GOP health-care bill. The OIG is also investigating Zinke’s decision to move 50 senior federal employees to new positions within the Interior Department, after a whistleblower said he was transferred because of his work on climate change. In October, the Campaign for Accountability asked the Office of Government Ethics to look into the millions of dollars Zinke has funneled into conservative “scam PACs” accused of misleading donors. Additionally, the Office of Special Counsel is examining Zinke’s appearances at political fundraisers during government trips, and the Interior OIG and Government Accountability Office are scrutinizing his $12,000 flight from Las Vegas to Montana in a plane owned by oil and gas executives, following an event with political donors. Though the investigations are serious, watchdog agencies and legal experts say they’re unlikely to result in criminal charges or impede Zinke’s plans to remake Interior. “This situation with the Interior secretary is abnormal,” says Kathleen Clark, law professor at Washington University in St. Louis. “But it could be likely he will have more of a political price rather than any specific legal price to pay.” Meanwhile, the barrage of charges and countercharges further erodes trust in the federal government. 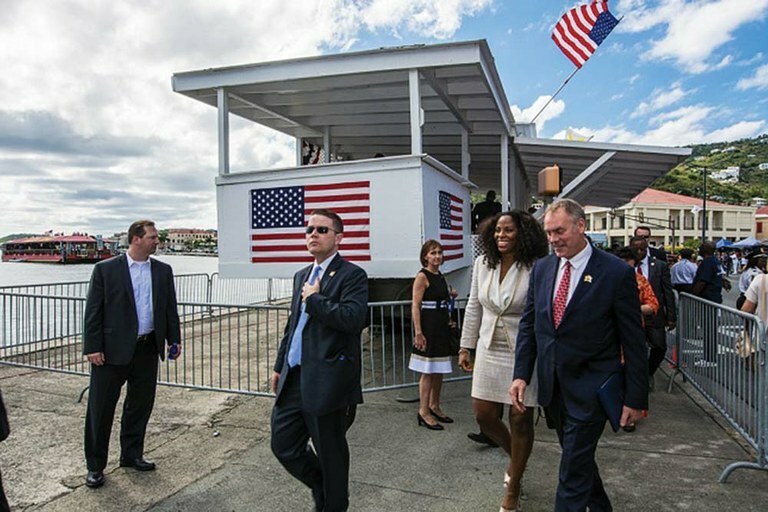 Interior Secretary Ryan Zinke enters a celebration for the 100th anniversary of U.S. control of the Virgin Islands. He visited the islands in March on a taxpayer-funded trip related to the Interior Department’s role overseeing the U.S. territory. On the same trip, he attended a Republican Party fundraiser. Congress has established OIG offices in most government agencies to investigate potential abuses of power, misuse of funds and other ethical violations. After investigations — which can take weeks, months or even years — the Inspector General is required to issue public reports. Historically, though, Interior’s OIG has published only a “small fraction” of these, says Jeff Ruch, executive director of Public Employees for Environmental Responsibility. In 2014, for instance, the department released reports on just three out of 40 cases. In light of this, some watchdog groups worry that any findings about Zinke’s conduct will simply pass unnoticed without outside pressure. Investigations are only effective “because of people’s reaction,” Ruch says. The Interior Department has faced scandals before. In 2008, the OIG found that Interior was riddled with them under the George W. Bush administration, including substance abuse, sexual misconduct and conflicts of interest with oil and gas companies. In 2012, an investigation found an Interior report was edited to suggest that the Obama administration’s proposed drilling moratorium after the Deepwater Horizon oil spill was peer-reviewed by scientific experts. But the Trump administration is “unusual” because of the number of complaints, says Stevens. The OIG and other agency watchdogs have yet to respond to some of the allegations, including whether David Bernhardt, deputy secretary of Interior, violated lobbying laws. A month after it launched the investigation into Zinke’s call to the Alaska senators, the Interior OIG dropped it. The senators declined to be interviewed, according to Deputy Inspector General Mary Kendall, acting head of the agency since 2009, so “the OIG does not believe that it could meaningfully investigate.” Interior OIG spokeswoman Nancy DiPaolo declined to comment on the other, ongoing investigations, and Interior did not respond to requests for comment. Other federal agencies may later weigh in. The independent Office of Special Counsel, for instance, is determining whether Zinke violated the Hatch Act, which prevents employees from engaging in political activity, by allegedly attending political fundraisers while on duty. The Government Accountability Office is also expected to release a legal opinion on Zinke’s call to the Alaskan senators.